Our Amish Burlington has a unique contemporary design. The table, which appears as though it should end at a solid wood slab base, is built upon a pedestal-like slab. The clean lines, yet strong features of the design will work well in a contemporary or modern home, and can work in a slightly formal setting as well. 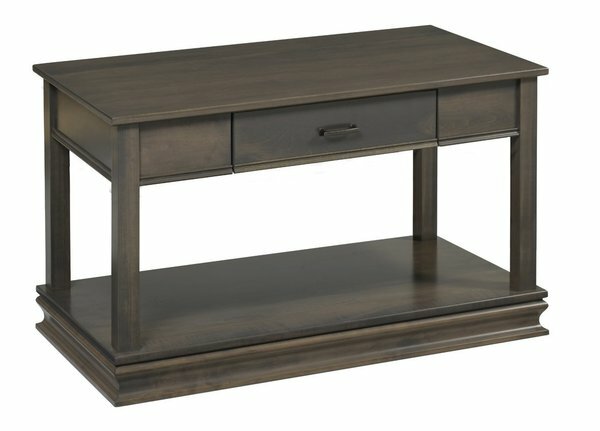 Other features of this piece include four square legs, and open design, and a drawer under the solid wood top. Shown in a trendy grey, this piece can be customized by selecting the wood type, finish, and hardware of your choice.